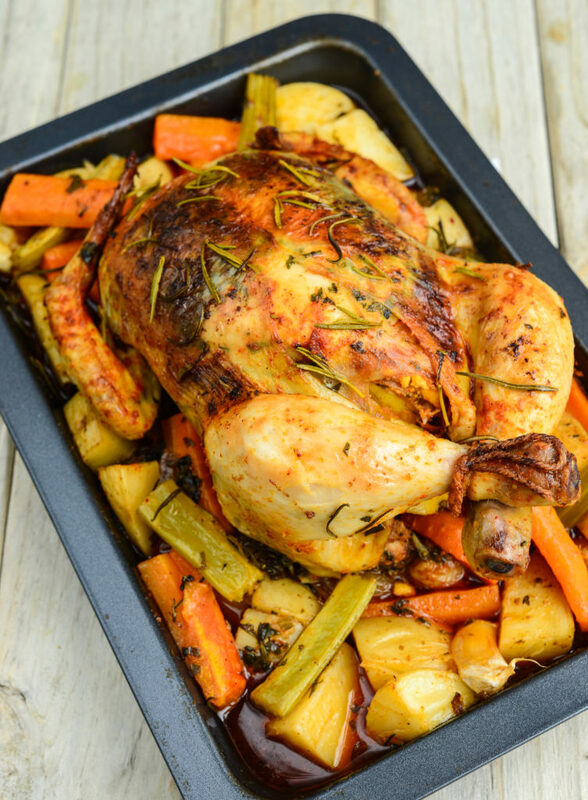 Easy and delicious Italian broiled chicken Fresh Italian herbs and seasonings make these roast chicken taste out-of-this-world delicious. Serve with sliced carrots wide (1/2 inch), an onion, a fennel (bulb) and two medium yukon or red potatoes with a drizzle of olive oil and a pinch of salt, for a hearty meal. The few recipes prepared with a budget of $ 20.00 for a family of 4, in addition to the ingredients you need to accompany the chicken. 1 whole chicken 3 ½ lbs. Note: You can substitute oregano, basil and thyme, rosemary, 2 tablespoons of Italian seasoning. Preheat oven to 375 ° F, combine the vinegar, oil, lemon juice, oregano, basil, garlic, salt, thyme, rosemary, pepper, divide herb mixture in half. 2. Inside Rinse chicken, pat dry. Slip your fingers between the skin and the breast meat,. Add the herb mixture with a spoon into the pockets that formed to separate the skin, including butter. If you want you can tie the legs with cord. Marinate about 20 minutes in refrigerator. 3. Place chicken, breast side up on rack or pan, bake 1 hour 30 minutes. 4. Remove chicken from oven. Cover with foil and let stand 10 minutes before carving.